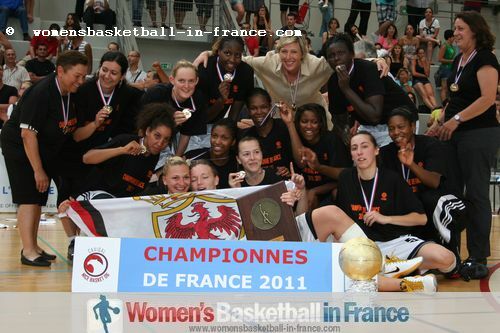 A common question asked to womensbasketball-in-france is if LF2 is a professional league. The answer is yes although there is a development tag associated with the second division. This means that each team must have at least four players under the age of 23 on the score sheet for each game. It is important to note that not all the players are professional. Cavigal Nice and COB Calais are the most professional teams in the LF2 this season. Both clubs have full time coaches and rosters that would be able to compete in the LFB. 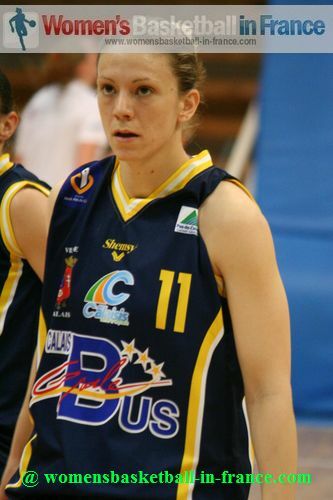 Cavigal Nice have retained their key players after their relegation from the LFB at the end of last season (2011-12). To complete their roster they have also brought in more players who had played in the LFB. The former experience of Rachid Meziane, the coach of the Niss Angels, in running the Challes-les-Eaux basketball academy has enabled him to run a programme in which young players such as Margaux Galliou-Loko, Marie-Eve Paget and Margaux Okou Zouzou can continue their full time education programme. Cavigal Nice had a tough road trip to Roche Vendée, but once again came out on top (62-47). Anaïs Déas led the way with 12 points and 3 assists while the ever reliable Jeanne Senghor-Sy added 10 points. At COB Calais, Kévin Brohan inherited a stable roster. So no major changes were required. Manon Sinico (in picture) explained that playing in the lower division can have its advantages when you are studying. She completed her nursing training last year. Sinico who is now concentrating on just playing basketball is a product of the Bourges Basket Academy. COB Calais with the fab four Aurélie Cibert (17 points and 6 assists), Manon Sinico (16 points and 5 assists), Mélanie Arnaud (17 points and 14 rebounds) and Floriane Herrscher (22 points) beat Pau Lacq Orthez (88-57). Léon Trégor, as Pleyber-Christ basketball club was really an Amateur organisation with most of the players coming from the region. The team struggled in the second division and always finished in the relegation zone. The club was forced to become professional and even with a limited budget their results improved and today (2013) as Léon Trégor they are one of the best clubs in LF2. All the players except for those promoted from the academy are now professional, but their coach Franck Simon is not. This weekend Léon Trégor kept their challenge for the title up with a road victory against Illkirch-Graffenstaden (86-63). Oumou Touré (15 rebounds) and Marie Butard (11 rebounds) maintained their good form with 24 and 20 points each. But it was the contribution of Leslie Matanga with 19 points that tipped the game in their favour. Angers' status as a club is not clear because most of the players are students. However they have some of the best young players in France and are currently in fourth place. This weekend they needed the efforts of their senior players Julie Barennes (21 points) and Carine Brossais (11 points) to beat the CFBB (61-49). US Laveyron's financial difficulties mean that they should not be able to play in the LFB if they win promotion at the end of the season. However this has not stopped the players from pushing up the LF2 table. They are currently in fifth place one game down on Angers. They defeated Dunkerque (61-60) with 21 points coming from Manon Moral. Although Dunkerque trailed for most of the game, they had the chance towards the end of the game to force overtime or even win. Yet as so often this season at home the ball refused to drop.